I was confused at first, too. Then, I looked into it. Working with top YouTube channels is a great way to accelerate the transition to sustainable energy by appealing to younger people. Anybody who follows Elon Musk on Twitter knows what I’m talking about. 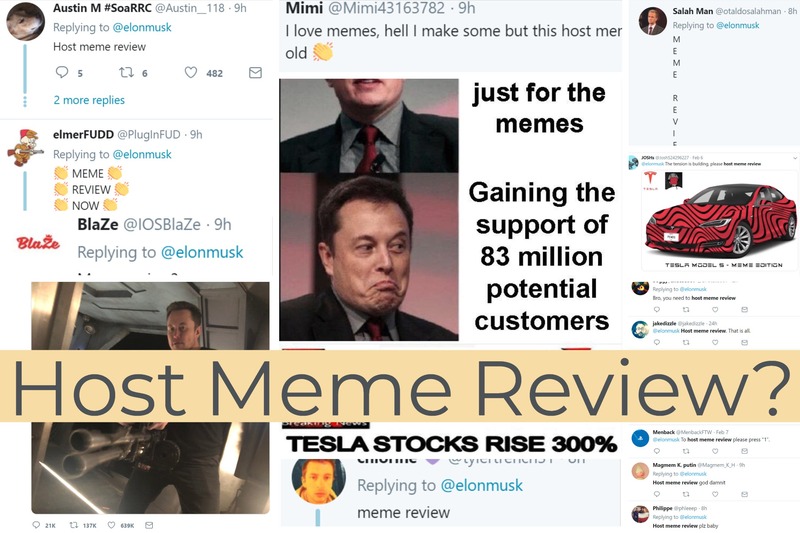 Every time he tweets, dozens or even hundreds of people respond with “host meme review.” It’s been this way for several months, with the first such replies starting to trickle in around mid-October. There’s even a Change.org petition! So, I sat down with the kids and got up to speed on it. PewDiePie is the #1 YouTube channel by subscribers, and one of his favorite segments is, unsurprisingly, Meme Review. He goes through several recent internet memes, including a variety of the meme’s variants. He gives the meme a rating, claps twice, and goes on to the next meme. I also noticed that many of the videos have between 5 and 10 million views, while the top videos have well over 100 million views, making PewDiePie an important media outlet all on his own. I’m also a member of a number of Tesla owner/enthusiast Facebook groups, and have seen no mention of the push to get Elon Musk to appear in a PewDiePie video. I can’t know why for sure, but my best educated guess is age demographics. Facebook is seeing an exodus of youth on its network while the 55+ age bracket is booming. Other networks, like Twitter, have a larger proportion of young users, and fans of PewDiePie are overwhelmingly young, with the top demographic being the 25–34 age group (which I am barely outside of myself). 55–64 year-old viewers make up only 1% of PewDiePie’s viewers. With all of this in mind, it shouldn’t surprise anyone that the Facebook group members were really excited to see Elon Musk appear on 60 Minutes in December, with little to no mention of PewDiePie. Even more than Facebook, 60 Minutes struggles to get younger viewers, with only a small portion of the viewers coming from the entire 18–54 demographic. Before anybody accuses me of trying to incite age conflict, I want to point out how similar these different audience groups are. Per episode viewership for PewDiePie is lower than 60 Minutes overall, but it’s not that much lower. The Associated Press reports that 60 Minutes gets an average of 11.1 million viewers per episode, with 111 million unique viewers every year. PewDiePie has anywhere from 3–20 million viewers per video, with many landing between 5 and 10 million. His channel’s featured video has over 120 million views. While I’ve seen a few older Twitter users take a “get off my lawn!” approach to the onslaught of “host meme review” tweets, there is no reason we shouldn’t all get along. We are just looking at two very different shows that are important to different age demographics. The commonalities between PewDiePie’s viewers and older Tesla fans are even more pronounced when we look at WHY the fans are demanding Elon Musk appear on the show. PewDiePie is in a big competition with YouTube’s #2 channel, T-Series. Based in India, T-Series focuses on Indian music and pop culture. Fans of both channels are in a full-on push to gather more subscribers, with many looking to recruit famous people to appear. Instead of seeking out music stars, politicians, or others, PewDiePie’s fans are looking for somebody they actually look up to and respect. Younger people overwhelmingly support Musk’s mission to accelerate the transition to sustainable energy, but also, they see him as a superhero of sorts, with comparisons to Tony Stark being common. While word on the street is that Elon Musk doesn’t always appreciate the comparison to Tony Stark, it does show that Tesla’s older fans and owners have much more in common with PewDiePie fans than they might think. For this reason, I think Elon Musk should seriously consider appearing in an episode of Meme Review. Further, he should probably look at getting some of his lesser known but very important executives onto channels popular with young people, and invite them to tour Tesla facilities with their cameras. There is a LOT of untapped potential. However, there is one issue that cannot be overlooked. PewDiePie’s competition with T-Series does have a dark side. T-Series fans see beating PewDiePie for the #1 spot as a matter of national pride. PewDiePie posted a “diss” video that mocked the Indian people, including references to defecation in the street. Many fans got into online arguments with each other, with racism rearing its ugly head. To PewDiePie’s credit, he condemned this behavior and spent time raising funds for an Indian civil rights NGO. I still think appearing on popular YouTube shows is a good idea, but care must be taken to not appear to take sides when channel rivalries get ugly like this. However, I am very confident that Musk and his staff are more than capable of navigating this issue. I hope that they take the time and effort to do so.